This is a very handy tool. 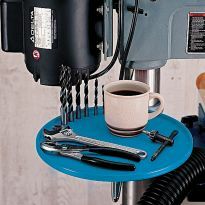 It can be used in a drill press, hand drill or by just using a wrench. 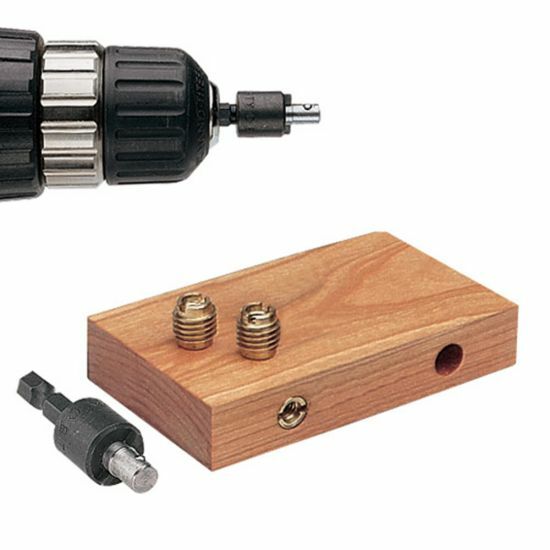 The item is so easy to use like the screwdriver bits it is a pop in and out tool for various drills (handheld and drill press). As for the inserts it eliminates the hassle or braking that occurs when using just a regular screwdriver in perform the insertion. I highly recommend the power Drill threaded insert tool. A Must have. 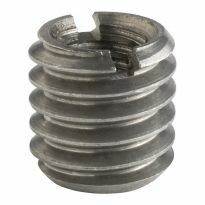 Works great and easy to use when instilling threaded inserts. Especially better then the one I brought from Woodcraft. Bought this with 3/8" threaded inserts for installing a birch butcher block onto an island I built. I used the tool with a dewalt impact and it installed easily with this tool into both oak and birch. The driver worked as advertised and made short work of driving the inserts I had also purchased. I was careful with the driver as I had read other reviewers state that the "wings" had broken off in useage. So I made sure that the hole the inserts were to be driven into were properly sized and not overly tight. On the other hand, if the metal wings are made from a too soft a material then that should be addressed otherwise a handy tool will not be sold very long. I have used threaded inserts many times over the years. This tool makes it so much easier than a bolt and jam nut! This helped me install 24 inserts into black locust. I also tried a big "2 fister" screw driver just to see which method I liked best. The tool was the clear winner. I was able to put the insert on the tool in the drill chuck (it holds the insert nicely on the driver blades) and drip some varnish onto the outer insert threads just before driving them into the wood. No runs no drips no errors. I was using bolts to drill in my threated inserts, with this tool it is easier and stays straighter. 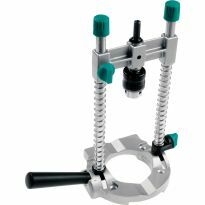 This little device proved to be very useful for easy and accurate driving of threaded inserts. It is well worth the small price especially when a project involves several threaded inserts. It took seconds to drive the insert into the specified hole size and it was easy to have them go in without trying to use some ill-fitting screwdriver that messes up the slot on the insert and puts them in slightly askew. I wanted t o put inserts into wood (for the first time) and purchased this tool. It works great. Much better than trying to insert them with a screwdriver. Having the right tool for the job at a moderate price was the way to go. I am replacing my previous tool. It does the job well but the wings which engage the insert need to be more durable. This works great. No wobble with a strong positive connection. I bought this to use for inserting threaded inserts. I use a 1/4 deep well socket on a 1/4" drive ratchet and it goes in better than using a hand drill. I really like having neat little tools like this. It makes installing the inserts so easy, does a great job, and its worth every penny to have the right tool for every job. Makes projects more fun! I rebuilt an old park bench which was comprised of a mahagony seat and backrest with cast iron ends. Most ends of the wooden seat and backrest slats were rotten so I trimmed them off, replaced (4)slats and counter-bored to accept the threaded inserts. The tool worked fine for about 75% of the holes when the tangs broke off; so I ordered a replacement to finish the job. Installation of the inserts without the tool is almost impossible, especially with the number of holes I had to contend with. I would not recommend installation without this tool. I used the 5/16&quot; in my drill press for driving a 3/8&quot;insert and turned the drill chuck using a 6&quot;long 1/4&quot;bolt. I had no problems in pine but did find it tough to turn in maple but still successful. Before I received the insert tool I twice tried driving this insert and broke the nubs on the inserts using a wide bladed screw driver before I got it all the way in. This insert tool is the solution. The product worked as indicated. I used the driver in the drill press and hand turned the inserts into oak on adjustable legs I was making for a table saw out feed table. Stand by elements of coffee table project. I have trouble with it, It may be my fault but I break the insert off. For now I put two nuts on a bolt and tightened them so that I could drive the inserts in that manner. After hearing numerous complaints of woodworkers trying to insert threaded inserts, I bought the Power Drive Threaded Insert Tool from Rockler and it worked quite well on the first try. [I'd never used this fastening method in previous work.] It is nicely machined and accurate. Though it seems a bit pricey, it pays off in results. It worked just fine. Again it would have been helpful to have a drill press. In a relatively soft wood such a popular you can control the insertion but the brass insert must be lubricated with bee's wax or soap. Take care when trying to back out an insert or the insertion tool will tear away the top of the brass insert. To avoid miss-alignment of the insert, apply a few turns with a screw driver. Screw a threaded rod into the insert, and adjust the alignment referencing the rod position. Remove the rod and finish with the "power drive" tool. Works great in a drill press turned by hand! This is a great product when you use it in a drill press turned by hand. I slip it into my drill press chuck, loosen the drive belts, and turn the chuck BY HAND! The drill press keeps the tool straight and my arm gets tired before I break the tool. The advertising photo implies that you can use this tool with a power hand tool. I don't own a power tool that has high enough torque and a low enough speed to keep from breaking the tool. The tool worked well, it installed the insert without tearing the ears off the nut. The purpose of the tool worked very well. It did do some tear out once it hit the wood. I used a cordless impact driver to install and it ripped apart the nubs on the nuts, maybe because they were brass and I was installing them in white oak. Overall it did what it was supposed to do. The driver was used to drive 1/2-20 steel inserts into 1/2&quot; Baltic Birch. The ears broke after driving 11 threaded inserts and in my oponion should have lasted longer. Use this driver with a drill with adjustable cluch on VERY LOW SETTING to prevent breaking the ears off. Great idea, but don't use it to drive all the way into hard wood (e.g. maple). It will break the tabs on the tool and strip the insert. Instead, use the tool to get it started (i.e. square), and then finish with a very large screwdriver (or two nuts on a bolt that you screw in with a ratchet). The review above by trohlf says that this tool doesn't fit the steel inserts. Well, it doesn't work for for the brass inserts either, at least not in hardwood. I broke 3 brass inserts and two pieces of wood trying. 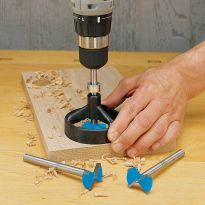 The picture on the Rockler web site shows this tool being used with brass inserts, but the brass insert description says that they should not be installed with a power drive tool. Apparently the solution is to tap the holes first, which renders this tool almost worthless. Broke on driving into wood after one insert. Hard to control and damaged the wood. Also overheated drill. a way to install the inserts with little trouble. make install quicker. easier too. I have had difficulty in the past driving the inserts so I thought it was time to use the insert tool. Need to set inserts in handles. To insert threaded inserts on this order. Difficult to insert, if not impossible, by using a screwdriver. Especially if you're using the brass inserts. I never knew this tool existed! Getting a hand-turned insert straight can be a challenge. To install threaded inserts for leveling feet, etc. Because over the years and many inserts used, I had always issues with either stripped or crooked (not vertically aligned) results and so I'm confident that this tool will do the job. to decrease the amount of installation time required. I try to have these things when I need them. This tool prevents breaking soft brass inserts. Much easier that getting the right size bolt and cutting it to fit in a drill. 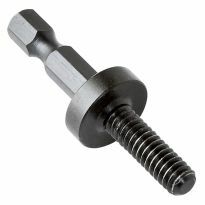 To make the installation of threaded inserts faster and easier. To make installing threaded inserts easier, quicker, and causing less damage to both inserts and my workpiece. BEST ANSWER: the 3/8" can have a verity of thread sizes, I got mine with 1/4"-20 thread. when you buy these inserts you have to pick the size you desire. It says in the description - 3/6 - 16 tpi for the 3/8 insert. What size drill bit do you use before you try to install a 1/4 20 brass insert ? 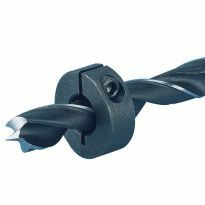 what size drill bit to use for driving a 5/16" brass threaded insert?